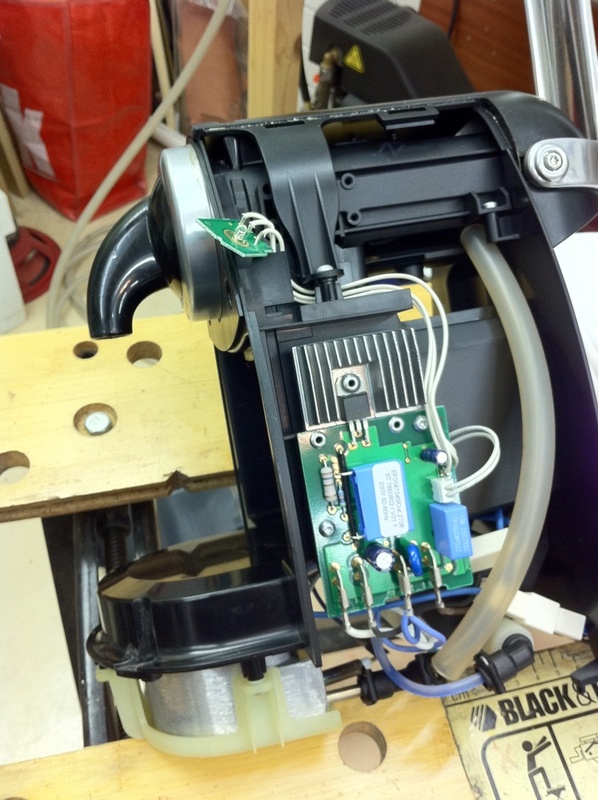 Maybe the title of this post should read “how to open a Krups XN2001 Nespresso machine”. The Krups XN2001 is almost identical to the newer XN2002 and XN2003. While the XN2003 has normal Torx screws, Krups was a bit more “protective” when they built the XN2001. It has screws that can not be gripped by any screwdriver. 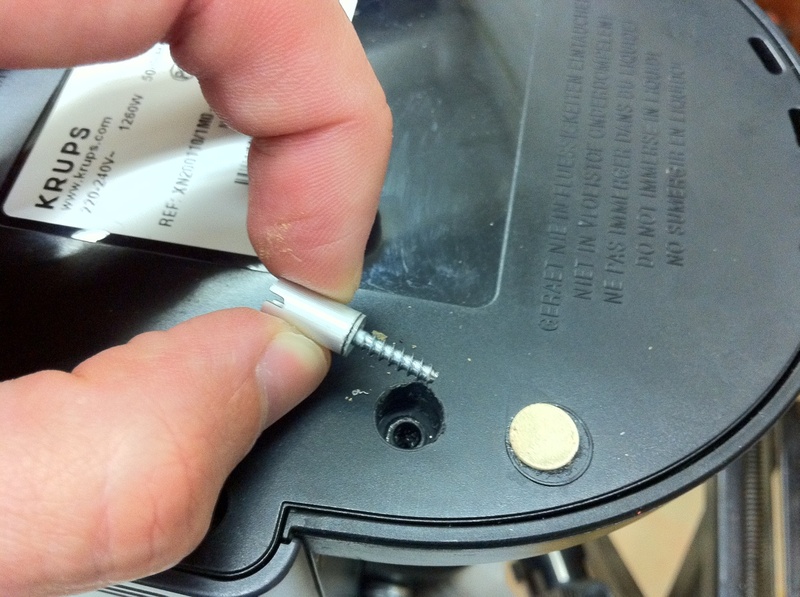 Still, there is an easy trick you can use to get headless screws out of any machine. My Krups XN2001 Nespresso maker has been working fine for the past few years. I descale it almost monthly with very cheap vinegar, but otherwise it needs no maintenance. 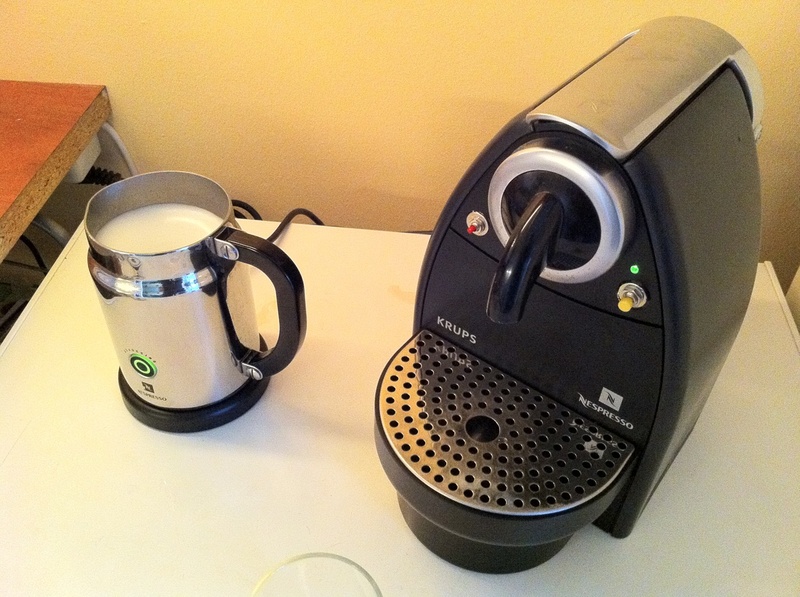 Just after I repaired my free Aeroccino, the power button of the Krups XN2001 started to fail. It was hard to turn the machine on, like there was a bad contact. 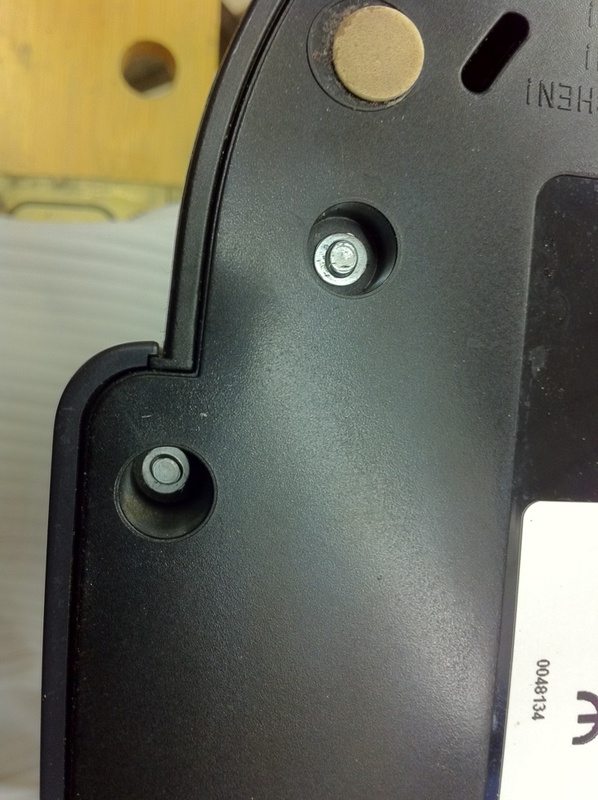 When I tried to open the Krups XN2001, I noticed these funny looking screws, which looked more like nails. After I discovered that these were actually normal screws, I needed to figure out how to get to the ones at the bottom. I took the Nespresso machine to a hardware store I frequently visit, and talked to a new hire there. I showed him the machine and he took off on a rant about how I should not open it, that it was dangerous, and it would void the warranty. I told him it was a five year old machine and it was for fun. Just when he got irritated and told me “doesn’t matter, you can’t open it”, a colleague of him overheard our conversation. He looked at the new hire, smiled, and while pointing at me said “but he can”. A few laughs and a short discussion later, it turned out that they did not have tools that would fit or grip the headless screws. I went into “MacGyver mode” and got an aluminum rod that fit nicely on top of the screw head without touching the plastics of the case, and grabbed a tube of industrial strength superglue. At home, I cut the rod into a few shorter bushings, and used the lathe to make them nice and flat. I carved a slot on the other end of each bushing with a dremel tool. Then, I carefully superglued the bushings onto the screws without touching the plastic, and let them settle for a few minutes. After the glue set, it was very easy to use a normal screwdriver to get the screws out. I took the screws with the glued bushings back to the hardware store to show them what I did and got me some new philips head screws with matching size. Once you open it, you can see how simple this machine is. There’s not much that can break, and parts look like they can be easily replaced. Instead of just cleaning the contacts in the button, I decided to go a little further and replaced the existing ones. I had to cut away some placeholders for the old pushbuttons, and drill a hole to hold the green led which tells you what the machine is doing. As you can see my Krups XN2001 now looks a bit “steampunked” but it works like a charm! This entry was posted on Saturday, August 27th, 2011 at 14:57 \14\Aug\UTC +0200 and is filed under Hardware. You can follow any responses to this entry through the RSS 2.0 feed. You can leave a response, or trackback from your own site. Nice. I just took a 6mm double screw [it is in fact a long screw-nut] shape its inside with Pliers and little hammer… in 10 min i had my D190 completely naked. thanks for the spirit! Just looked at your Krups XN2001 repair. That’s exactly what I want to do. Lookes great. Removed allready the on/off switch and added a toggle switch. The other, temperature or warming up switch, I want to change as well with a toggle switch. I looked at your pictures. You have added a seperate light (green) to the housing. The three white wires from the little printed circuit board go to the swich (2) and one to the light. My question is where does that orange wire go to? Can you help? If you look carefully at the printed circuit board, you see that the LED and the switch share one connection. Because my LED is farther away, I needed an extra wire to connect the switch and the LED the same way as on the board. By the way I would not recommend toggle switches, they probably will not work. You’ll want to use push buttons. I installed a push button and a seperate LED light as per your instructions and the machine works again like a charm. I left the power on/off toggle swich in place. Is there any reason why you do not recommend a toggle switch? I bought two push buttons so I have one standing by, just in case. The whole operation costed me 2.80 Euro. Thanks for your wonderfull assistence. I recommend a push button because the original button is also a push button, not a toggle switch. Same advice I gave bram: Look at the board. The first white wite goes to one end of the switch. The second white wire goes to the switch and the led (this is probably the ground wire), and the third white wire goes just to one end of the LED. Make pictures. Mark the LED, as it will not work if you connect it the other way around. Unsolder the marked wires and the marked LED. Drill a hole for the LED, and connect everything up exactly the same as it was on the circuit board. The LED and the switch should both work perfectly. Thank you for your response. I managed to mark and identify the wires last night. Now its working but without the LED (i just feel if its warm or not, then i know its on). So, the fourth wire is something you ran off of one part of the new button. And that’s just electronics wire, any particular strength? And sorry one more question, did you reuse the LED or buy a new one? Im trying to figure out how you separated the LED from the board. Thank you again! It’s the original LED, with a soldering iron it’s easy to remove from the board. The orange wire is one that I had lying around, just a general electronics wire, no particular strength. An LED like this takes about 20mA, any wire will do really. HELP WITH TROUBLESHOOTING – After taking apart and cleaning and checking all electronic components, I still get the blinking lights 3 times. Then, I measure the following resistance with a multimeter – NTC = 93.5 k Ohms, T167 Fuse = 0.2 Ohms, Thermoblock = 44.9 Ohms, T 128 Fuse = 0.3 Ohms, Pump Motor = 311 k Ohms. Are these normal? Or is the Pump Motor burnt up? If not, I guess I need to buy a new electronic main board? Any ideas on where and how much it costs? Hi Larry, I only replaced the buttons, I never checked any other parts in the machine, so I don’t know if the things you are measuring are expected values. The pump motor feels like a high resistance but I don’t know what type of pump it is and if it should be like that. You say you get the blinking light 3 times. Is that after plugging in, or turning on? After blinking, does the light go out or stay on? Does the base of the machine get warm (it should)? Thanks for the reply. As soon as I turn the switch to ‘on’ both lights flash 3 times pauses for a second, then flashes 3 more times and continues to repeat this cycle with no way of getting it to reset. Nothing turns on or heats up. According to the troubleshooting manual I was able to get my hands on this means a component failure and then gives you a list of what components to check and in what order – the only problem it does not tell you exactly how to check. The T128 e T167 Fuse must be near 0ohm (0 – 50 ohm). The NTC is 100Kohm at ambient temperature around 25º C. It will increase a lot as the temperature rises. The pump i didnt measure so i dont know if its ok or not, sorry. Larry, if you want to fix your nespresso machine, replace the two blue “squared” capacitors on the board with others with the EXACTLY same values. Pay attention to use capacitor X2 type! I had the same problem and I fixed successfully. I used an aluminum spacer and vise grips to create an oval driver. A hacksaw blade across the opposite side allows the spacer to accept a flat head screw driver. I took the panels off and ran a cycle to find a source of the leak. Evidence pointed me to the water heater inlet hose and a blown rubber O ring. Couldn’t find the O ring locally so I used silicon gasket cement to “roll my own”. No more leaks. Thanks for hosting this column. Great post. It helped me a lot to know that these strange metal points were actually just screws. I looked in my shed to find a small metal tube of the right size and hammered the end to an oval form. The screws are not tightened very strong, so no problem getting them out and in again. I had the same problem with a faulty on/off switch. I just cleaned the contact and it works again. Thx for your discription on how to open the krups machine. I found you through Google. We experienced the same problem. I want to tell you That i opened the machine by using a pair of pointed pliers. Your blog was very usefull in this case. Many thanks again. When I first repaired a machine, I replaced the switsch as well. But then I got the hint to use graphite spray in the back of the silicon buttons. Remember not to spray into the LED button but use a stick or something else to cover it. Good tip! Which graphite spray did you use? The screws are called TORX for reference. Take a close look at the photos Jonathan. The newer models have torx screws, yes, but mine did not. thank you for your manual. could you help me please to find the silicon button for nespresso essenza? Hi Sascha, if you look at the pictures in my blogpost, you’ll notice I replaced the silicone buttons with “normal” pushbuttons. Maybe you can buy an old Essenza and salvage parts from it. Hi all and thanks in advance for your help. I still have a problem: when pressing the coffee button, the machine starts brewing coffee but then it tends to quit after less than a second and it powers off. I can power it back on so I can make coffee few drops at a time, but obvioulsy it’s not ideal. Sometimes, like once every 10 times, it can regularly make coffee, but certainly there is no way to make 2 coffees in a row. – the coffee button has been cleaned in the same way as the power button (cotton stick with alcohol). I do not think that replacing the blue capacitors, as per Enzo’s recommendation, would help in this case as the machine gets ready indeed. Also, the fact that the machine powers off makes me think it’s not a mechanical issue – e.g. back of the button still dirty – or else it should not power off! Does that sound to you any pressure/temp sensor kicking in? If it just quits maybe the brewing button makes contact again (second press stops brewing). But you say it powers down, which is quite different. Maybe the spacing on the power button became close after cleaning it, and the vibration of the machine causes it to make contact. A heat sensor can also be at fault, as you say you can not make two coffees in a row. What doesn’t add up is that if you press harder on the coffee button, it switches off earlier. That takes us back to that button again. Can you run it without the covers on, and take the two buttons out? If you can brew coffee without the rubber on te buttons, then the buttons are the problem. If not, I’d look for a faulty thermo sensor but I have no idea where that would be. I got to the conclusion that there were multiple concurrent reasons for the fault and it was time to replace the machine, after 5 years of excellent services. In the end I purchased a new one. I just managed to replace the red button without removing any of the oval screws. How? Just remove the lever arm.. Then “split” the top of the machine by using a screwdriver. Both the side panels can easily be forced outwards with the base still fixed. 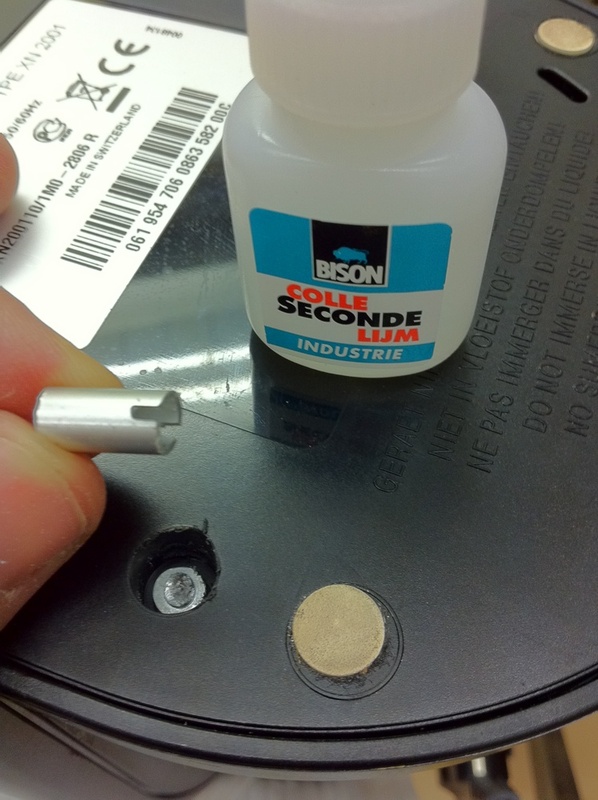 The resulting access is sufficient to remove the next internal piece and subsequently to replace the button. Then I loosened the in and out of the heater and checked if the flow was not disturbed, caused by insufficient descaling. No apparent problem there. The temperature sensor also was working well as the blinking of the green led moved to steady green when the temperature level was met. Very hot indeed when touching accidentally by your finger! So what could be the reason of powering off when asking the machine to start the pump? The electronic module who did not succeed to swich the mains to the pump due to the amount of current it needs. Aging of one or more of the electronic components (capacitors maybe)? I decided to take another solution and did not touch to the electronics. I removed the green button and replaced it by a on-off switch to apply the mains directly to the pump. The green led was dismounted and placed through a small hole drilled in the front. That did the trick! I only have to wait until the green blinking stops, then I start the pump. Otherwise I get a brew which is cold or lukewarm. Many thanks for this most informative blog. 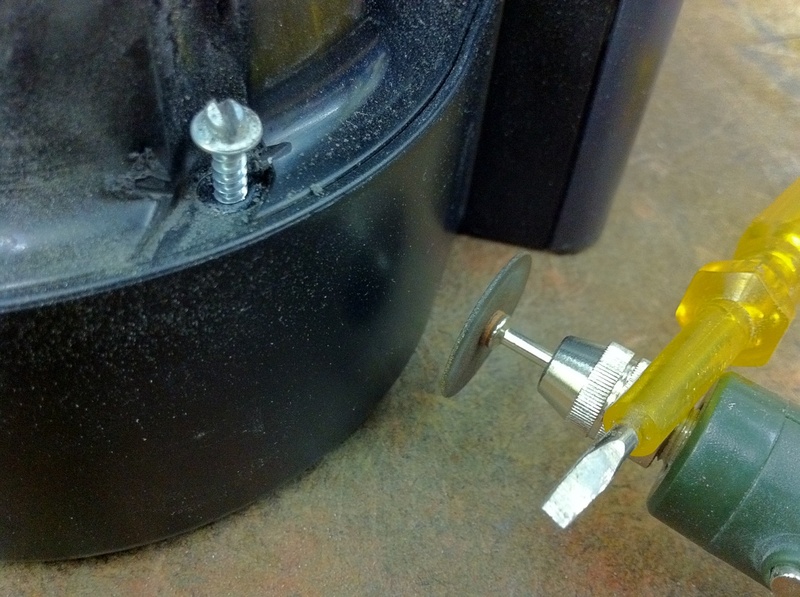 I had a case of ” the weird green flashing light ” the pump ran fir second or two, then stopped……..so all I did was drill out the plastic around the recessed ” Copyright” screws, enough for me to grab the screw head with a needle nose pliers. A Note : as the screws were installed in the factory with a compressed air gun, the torque setting is relatively low, so that makes it pretty easy to grab and SLOWLY twist the “copyright” screws. I naturally replaced them with Phillips heads. Thanks for the great tip on how to replace the capacitors! Rafael, from Spain: I used the BIC trick for the bolts. Took some time, but it worked!! Thanks!!! Thanks for the helpful and informative post. I am fortunate enough that my malfunctioning Krups Nespresso machine has the regular Torx screws, so no problem opening it for diagnostics. In my case, the tapered rubber ring in the machine base which should mate to the removable water reservoir spigot is not sealing properly, allowing water to seep out into the base of the machine, and then away to the outside world. Backing up the original ring with a thin rubber washer didn’t help, and it looks like running a bead of silicone won’t correct the problem either. Anybody have a clever solution to this problem? Thanks in advance. I have a nespresso krups xn6006 and the machine won’t switch on. I would really like to fix it myself, but have close to no experience. Do you have any idea what the problem could be or where I could find more info? Google doesn’t give me any results (on my model). A machine that does not start up can have all kinds of problems, I’d start with checking the fuse. The other components are hard to check visually, you’ll probably need a multimeter and a soldering iron. 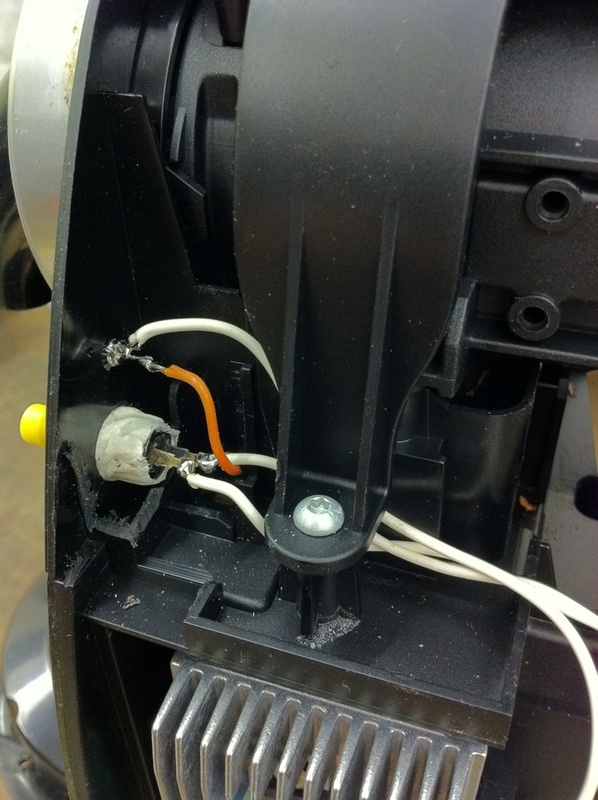 If you have close to no experience, be careful and please do not forget to disconnect the machine from the power when it is open, and only plug it in when you’ve closed it up again. Stay safe! Thanks for the quick reply. I ll only check the fuses then. I opened up the machine, but cant seem to get any further (more to the inside of the machine). No walktrough/guide available I guess on that type? I didn’t find a repair guide for that type, but I suspect it should not be all that different from the XN2001. It is basically a heater, a timer, and a 2 bar membrane pump. It’s just the plastics that are different, for the largest part. thanks a lot. I ll have a look into it. The Nespresso machines are not keen on accepting other pods. These generally break or deteriorate the seals and joints of your machine. I always advise against using aftermarket pods. After al, you did not buy a Nespresso machine to get Senseo coffee now did you? As for the pivot: In the XN 2001 I think the pivot are 2 screws left and write of the aluminum handle. I don’t know the C91, but if it’s really a pin, maybe you could get away with replacing it with a threaded rod of the right size. Thank you. I think I have a solution. My C91 is also labelled Essenza. The handle attaches to the pin through slots, with screws for security. I think I can fabricate a steel rod with grooves sawed in to drive the protrusions on the piston shaft, and file the ends to take the handle. I have a metalworker friend. Or just glue a smooth or threaded rod in place. That will let me see if my misbehavior damaged anything else. The machine was excessed by my son, and I am only planning to use it as backup to my lovingly-restored old Olympia Maximatic, which is working very well and makes an espresso as close to perfect as I could taste. The Nespresso Kazaar comes close! Hi, thanks for your blog. Without you I would have given up. These screws did not even look like screws, more like rivets. Now my machine works like new. Hi, thanks for all your help! I repaired my on/off button by cleaning it but now my machine doesnt heat, could you tell what is the main cause? Sounds like you forgot to place back all connectors. If the led is on, the connections to your heater element might be disconnected. It’s working now, thanks for your fast answer! just one more thing, this is my first nespresso machine and when i tried to take a coffee, there’s some water running into the capsules compartment filling that little deposit below the cup’s place. If i take 2-3 coffees i have to empty it. I think it is some water that ,during the process, cant go through the capsule and comes back. A friend said to me it was normal and a known issue. It’s true? Because i think the coffees are getting to “light”. Thanks again for your answer! It is normal to have a little water in that compartment but it should be from opening the lid just after making coffee. If the compartment is full after 2 or 3 coffees, you probably have a leak. Check the plunger edges, the capsule “piercer” edges. If you have it open, carefully try to make coffee to see where it leaks. Be careful, I normally don’t recommend running an opened machine, especially with water that’s dangerous. Hope you find it, stay safe! I’ve an nespresso le cube, when switched on nothing happens. Opened up the bugger nothing strange to see. Even in line fuses look normal on sight. Any clou what can be the problem? Fuses are hard to judge on sight. Disconnect the bedsores so machine from the mains and measure the fuses with a multimeter. The exact information I was looking for! Hi Ibrahim, I don’t have pictures of the power board, other than the one you see in the article. Is there physical damage on your power board? Sounds like something is stuck inside the capsule holder. Did you check to see what is blocking it? Don’t force anything! Hi, I have a Nespresso Essenza looks exactly like yours. Bought an oval screwdriver from Ebay, tick. Took it apart as for weeks I had irregular blinking from the silicone buttons and in the end the machine does not start at all. Interior is super clean, no leaks, I tested the power pre and post switch, all good. And then the blue and brown cables go to thermal sensors screwed to the heater part (looks like big piece of aluminum). Past those sensors there is no power which I would possibly understand as the thing is not heating. But when I started the machine -when it worked normally- the buttons would light up and blink until this unit heats up at which point the blinking would stop. Right now I have no clue why this is not happening and how the buttons are supposed to get any power at all as it seems the main power has to go through this unit anyway. Right now the all thing feels dead: it does not make the slightest difference if it’s plugged in or not, switched on or not!